Poverty is a big issue these days, but it depends on what sort of or degree of poverty. ‘Neoliberalism’ is blamed for poverty (and many other things), but it hasn’t been all bad. Neoliberalism is often used as a dirty word in political discussions in New Zealand, but it has coincided with significant progress on poverty around the world. In fact, the economic liberalization and globalization that started in the late 1970s and accelerated in the 1980s, has led to a massive and historically unprecedented decline in global poverty. Let us look at the global picture first. In 1981, the year Ronald Reagan became America’s 40th President, 44.3 percent of the world lived in extreme poverty (i.e., less than $1.90 per person per day). Last year, it was 9.6 percent. That’s a decline of 78 percent. In East Asia, a region of the world that includes China, 80.6 percent of people lived in extreme poverty. Today, 4.1 percent do—a 95 percent reduction. Even in sub-Saharan Africa, a relatively under-performing region, the share of the population living on less than $1.9 per day dropped by 38 percent. Economic and social changes in the last forty years have certainly seen some adverse effects, but there have also been benefits for many people – billions of people. We have negligible extreme poverty in New Zealand. There are significant numbers of people who find things economically and socially tough, but political arguments here about poverty tend more towards and get confused with seeking equality. After a year how transformative has the Labour-led Government been? The Labour-NZ First-Green government is now a year old. Thomas Coughlan at Newsroom asks whether the current Government is truly a government of change – One year on: Change worthy of its name? Transformation is a word we hear a lot to describe this Government. The Government’s speech from the throne promised a “government of transformation”, and followed that up in May with a Budget that Finance Minister Grant Robertson said was “the first steps in a plan for transformation”. The second word we hear a lot is “transition”. What they mean to say is “government of change”, which was Ardern’s wording in what became known as her reset speech, which she made in September. All governments change things, and the world changes. The pertinent question here is whether Ardern and her government are living up to her hype. The Government has finished just 18 KiwiBuild homes (although it has started construction on more), the waitlist for social housing has grown, and the $2.8 billion investment in fees-free tertiary education hasn’t changed enrolment numbers, although the University of Auckland has tumbled down global league tables. As for climate change, apparently our “nuclear-free moment”, under the current Government, big dairy can still dial up a a $600 million M. Bovis bailout for a self-inflicted crisis, while the much-lauded Green Investment Fund gets just $100 million. The problem for this Government is that it knows what change looks like and it’s afraid. It knows that true change is ugly and real people get hurt. People living under the big-change governments of the 1980s knew they were living in a time of massive change. So, can Ardern be kind and transformative at the same time? One year on, we’ve seen this Government’s definition of change. With the exception of KiwiBuild, its flagship change policies signal change in direction without enacting specific policy. Supporters say this means the change will be more lasting – and they’re probably right. Both the Child Poverty Reduction Bill and the Zero Carbon Bill have bipartisan support, meaning they will likely survive into the future. Likewise, the Wellbeing Framework has the potential to change how we look at the economy, although proof of that is many years away. But, especially on the issue of climate change, its slowly-softly policy platform absolves the current Government from making any of the tough decisions necessary when implementing change. It’s an unpalatable truth that change means picking losers as much as picking winners. The question hanging over the Government now is whether there is time to implement what it calls a “just transition”, to a halcyon economy of low unemployment, high productivity, and fair incomes. “Just transition” is essentially the oil and gas exploration ban writ large — big change, but slowly. But a just transition doesn’t need to be slow and there’s nothing just about waiting 30 years for house prices to stabilise. Just transitions could mean using the power of the welfare state to cushion the pain of change, like the governments of the 1980s should have done. There’s little room to be complacent. The window of opportunity is closing. Change is the sword of Damocles hanging over all our governments. And while this Government thinks the lesson from the 1980s is that slow change is best, it would be wise to pay attention to the other lesson from that decade: governments are not the only agents of change and those who fail to act in time will often find their hand forced by events. Governments are always forced by events to act. They need to manage forced change along with reforming or transformative change, if they can. In their first year the Government has changed some things, but they have only talked about most changes they propose, and it’s still not clear what they are going to change this term as they await the outcome of their many working groups/inquiries etc. The first anniversary has provided a chance for Ardern and her team to look back on their successes and failures so far – but what challenges lay in wait for them before the next election? National’s gleeful mockery of the coalition’s working group fixation seemed a little insincere at the start, given the party was not averse to the odd policy review and panel during its first term. However, there is a kernel of truth in that the Government is now waiting on the results of numerous inquiries into some critical policy areas, some of which will not report back until just before the next election, until it takes action. As the reports and recommendations trickle in, the potential bill for implementing all that is asked for will slowly mount up. The Government’s plans to shake up the criminal justice system loom as perhaps its highest-risk, highest-reward reforms. If Justice Minister Andrew Little and Corrections Minister Kelvin Davis succeed, the prison population will be reduced by 30 percent within a decade, addressing what Bill English once called the “moral and fiscal failure” of prisons. However, National’s cries of the coalition being “soft on crime” provide a taste of its likely campaign against any firm proposals for reform, as well as the outcry which may result from any crimes following law changes (no matter their merit on balance). Part of that proliferation of working groups, but worthy of mention in its own right, is the Government’s Tax Working Group – a political slow-burner that could divide the coalition right up to the next election. Chaired by former finance minister Michael Cullen, it will present its final report on the future of New Zealand’s tax system next February. However, the Government has committed to putting any recommendations from the group to the electorate in 2020, meaning any changes would not be implemented until at least April 2021. The sticking point is the issue of a capital gains tax. So at best this will be a plan for transformation put to voters at the next election. It’s one thing to call climate change the nuclear moment of our generation, it’s another to do something about it. Climate Change Minister, and Green co-leader, James Shaw said the IPCC report was broadly in line with the Government’s direction on climate change. But talk, as they say, is cheap. There have been some climate-related policy changes, including a ban on new oil and gas permits and the establishment of a $100 million green investment fund. Also in the wings are a Zero Carbon Bill, emissions trading scheme changes and the creation of a Climate Change Commission. The biggest pressure on the Government is its own rhetoric. Those disappointed by the environmental record of Helen Clark’s Labour-led coalition will be looking to the Green Party to push the Government into taking stronger, tangible steps. Ardern has talked big on climate change, but we are yet to see how her Government will transform things. Also, not mentioned in the Newsroom article, is another issue that Ardern has staked her reputation on, child poverty. Her Government quickly increased some benefits, but there has not been much sign of a revolution on poverty yet. The Government has another two years to prove to voters that they are capable of walking the walk and delivering meaningful transformation at the same time as they competently manage normal management and also dealing with things that are thrown at them. Greens also have a lot at stake – they have talked about a green revolution for long enough. They have to deliver something significant to justify voters’ trust in them. NZ First probably just need to deliver Winston Peters to the voting papers for the party to survive. As a whole the Government has been far more talk (and working group) than walk. They may end up sprinting to the next election hoping voters will pass them the baton for another term. Having a fair and equal-ish society is a good ideal to aspire to, but it’s difficult and complicated. Poverty, and things like health, housing and education inequalities are not just things that money can fix, whether it be Government money used to try to fix problems, or income level;s for individuals and families. Things like drug and alcohol abuse, family and public violence and sexual abuse are often intergenerational problems that can’t be quickly or easily fixed. But of course we should try to better – our government should, or society should, our families should. Just taking money off people with plenty and giving it to people with relative poverty is not going to work, even if politicians tried – they keep moving in that direction, but only so far. Now we have an economy that fails to pay many a reasonable wage or meet their material needs; that is driven by unsustainable debt, production and consumption; that rapidly degrades our ecosystem on which we depend, as documented by Environment Aotearoa 2015, the Government’s first comprehensive evaluation of our ecosystem. On our current trajectory, all those will get worse. But again, we are not alone. Those are the characteristics of the global economy, albeit we give our own expression to them such as the rapid expansion of dairy farming and international tourism. Oram is not a politician, nor is he, I presume, someone suffering from significant deprivation or poverty. he’s more of an academic keyboard solution writer – but still worth reading. In everything we do we need to ask ourselves how do we work with nature not against it? Working better with nature is just a part of what we need to do. Poor people tend to concentrate on surviving, getting by day to day as best they they can, and tend to not worry too much about greater ideals. You can take a poor person to the supermarket, but you can’t make them buy only healthy eco-friendly products with no plastic. We cannot take for granted our urgently needed transformation. It requires us to achieve an unprecedented speed of change, scale of change and complexity of change we have never come within cooee of before. To do so, we have to be a confident, ambitious, learning and inclusive nation so everyone can contribute to and benefit from becoming deeply sustainable. Sounds ok in theory. Has he got a magic wand? Changing some things at an unprecedented speed may be good, even necessary, but it won’t be without hardships and adverse effects and unintended consequences. Above all three attributes are essential to us a nation: common sense of what we need to do, common purpose as to how we will do it, and common wealth from sharing the rewards widely. I wonder what Oram is doing about it other than writing. As grand as Jacinda Ardern’s ambitions sound (to some) there is no sign of the current Government coming close to following Oram’s pathway to Utopia. There is Paradise in New Zealand, but it’s in the remote Dart Valley, beyond Glenorchy at the head of Lake Wakitipu. It won’t be easy getting us all there and living happily together. Many people claim or believe that poverty its a either an unresolved problem or a growing problem, but statistics show that it has improved substantially. In 1820, more than 90 per cent of the world population lived on less than $2 a day and more than 80 per cent lived on less than $1 a day (adjusted for inflation and differences in purchasing power). By 2015, less than 10 per cent of people lived on less than $1.90 a day, the World Bank’s current official definition of extreme poverty. Not only has the percentage of people living in poverty declined, but the number of people in poverty has fallen as well – despite massive population growth. There are also more people alive who are not in penury than there have ever been. From 1820 to 2015, the number of people in extreme poverty fell from over a billion to 700 million, while the number of people better off than that rose from a mere 60 million to 6.6 billion. Globally, poverty is about a quarter of what it was in 1990. 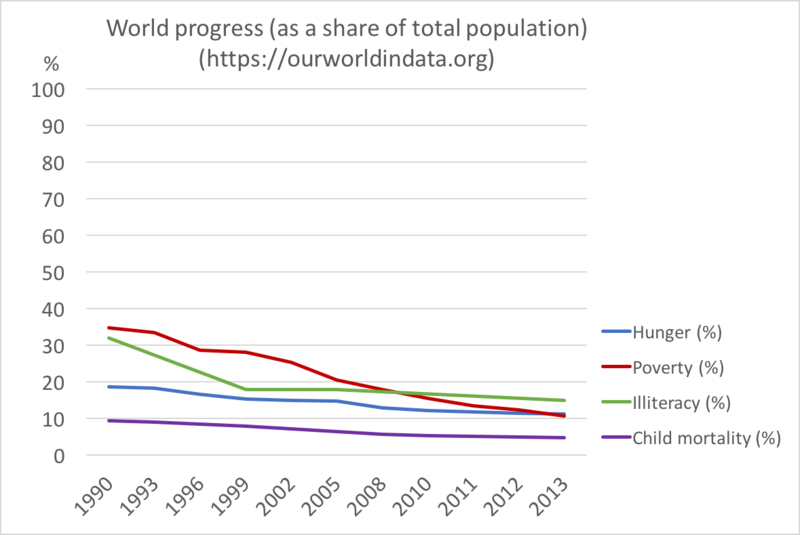 And the graph below from Johan Norberg’s excellent book, Progress: 10 Reasons to Look Forward to the Future, illustrates how the decline of extreme poverty has raised living standards and brought about other tangible improvements. As poverty has lessened, so have child mortality, illiteracy, and even pollution in wealthy countries – all are now less than half of what they were in 1990. Hunger has also become much rarer. If progress continues on its current trajectory, the Brookings Institution estimated in 2013 that extreme poverty (this time defined as living on $1.25 a day, again adjusted for inflation and differences in purchasing power) will all but vanish by 2030, affecting only 5 per cent of the global population. This is what they considered to be the “baseline” or most likely scenario. In the best-case scenario, they predicted that by 2030 poverty will decrease to a truly negligible level, affecting only 1.4 per cent of the planet’s population. This is a measure of significant or extreme poverty. Debate over poverty in New Zealand has risen over the last few years, but i think this is a different degree of poverty – many people are not as well off as they perhaps they should be in a modern society, but even here dire living conditions are uncommon. And – have the claims of poverty been less prominent since the Labour led Government came to power? I don’t think the situation of the country’s poor people has changed markedly, but the focus seems to have faded away. However here is still plenty that can and should be done to improve the living conditions and prospects for the poorest people in New Zealand. Can poor people only afford fattening foods, or do they make poor nutrition choices? Are they more easily attracted to junk food by advertising? More money or more education? It’s not a simple issue. I don’t know how well researched this is. Bryce Edwards looks at a shift in Government shifting from race-based (Maori) targeting to a more universal approach to dealing with poverty, but they say that as Maori feature in the deprivation statistics they should benefit the most. Is this related to Winston Peters’ past attacks on Whanau Ora, with Labour now quietly accommodating his preference away from targeting Maori? Where do the Greens stand? Quietly on the sideline? Lost amongst the focus on BBQs, relentless positivity, and eloquent speeches at Waitangi, a fascinating and important shift in Government-Maori relations appeared to be underway. Labour and Prime Minister Jacinda Ardern have been signalling that this Government is departing from the traditional culturalist and “race-based” approach to dealing with Maori deprivation and economic inequality. Instead, a more universal, economic-focused method will be used. The conventional approach of advancing Maori aspirations was epitomised by the Maori Party’s focus on culture, race, and sovereignty issues, and it appears to be on the way out. Heralding what may be a highly controversial approach to “closing the gaps” in terms of Maori inequality, Jacinda Ardern made her most important speech at Waitangi by stating that the new Government would take a universalistic approach to inequality – by targeting everyone at the bottom, rather than specifically targeting Maori. Jacinda Ardern strongly emphasised the need to deal with the long list of social ills that have a disproportionate impact on Maori, but signalled that race-based methods were not the best way of moving forward. Since then, the Finance Minister has confirmed this shift in approach to dealing with inequality. In an interview with Morning Report’s Guyon Espiner on Wednesday, Grant Robertson responded to questions about whether the Government would specifically target Maori in its programmes, saying: “Our focus is on reducing inequality overall” – you can listen to the six-minute interview here: Global market dive: Grant Robertson optimistic. “Maori will benefit disproportionally from the families package – from those payments, because at the moment, unfortunately, Maori appear in those negative statistics. We’ve got a range of programmes coming down the line that will support Maori and the wider population as well. Where it’s appropriate, where there are programmes – particularly in an area like Corrections – where we know that we can have a real impact on that Maori prison population, then we’ll have a look at them. Essentially, this new approach means directing resources and solutions to poor Maori “because they are poor” rather than “because they are Maori”. In RNZ interviews following on from Robertson’s, both Willie Jackson and John Tamihere reacted negatively against the notion that the Government was shifting in this direction – you can listen to the interviews with Jackson and Tamihere. Jackson is a Labour MP. The Government’s shift away from focusing on iwi property rights has also been signaled by Regional Development Minister Shane Jones. Sam Sachdeva reports: “Whereas English and his predecessor John Key seemed to focus on Article Two of the Treaty of Waitangi and property rights, Jones says the new government will have a greater emphasis on Article Three and the entitlements, rights and obligations of citizenship” – see: A fresh start at Waitangi?. This might all end up in legal fights. 1News has obtained the letter from iwi leaders to the prime minister complaining about their change in direction, and threatening Supreme Court action if iwi rights to freshwater were not addressed – see TVNZ: Iwi leaders unhappy issues like water ownership aren’t on new Government’s radar. There was nothing about this in the Labour-NZ First coalition agreement. I wonder what the Greens think. And I wonder how much they have been consulted. Prime Minister Jacinda Ardern tried to reach out to Bill English and National over proposals to better measure poverty, but it has become a messy stoush. Reducing child poverty was a strong focus for both National and Labour during the election campaign, and the government promised a bi-partisan approach. Ms Arden contacted National Party leader Bill English late last year about consulting on the draft bill. In the letter dated 13 December, Ms Ardern included a “key summary of the proposed Bill”. It said there would be child poverty targets but they would not be included in legislation so as to not “bind future governments to any particular target”. The letter sought feedback from Mr English, along with an offer for a briefing from officials. With the bill due to be introduced to Parliament tomorrow, Mr English told Morning Report this morning his party has had no opportunity to influence the shape of the bill. Ms Ardern said she was “saddened” to hear this, as she had reached out last year. “I hope we did provide that opportunity, again we have a select committee process to go through as well on top so I still hope we’ll get support from all parties. She said she would happy to still work with National outside of the select committee process as the Bill progresses through Parliament. Mr English said the Better Public Service targets were a key component of this policy, which he raised in his response to Ms Ardern. But there had been no chance to discuss the targets before they were scrapped, he said. This came up in question time in Parliament yesterday. 2. Rt Hon BILL ENGLISH (Leader of the Opposition) to the Prime Minister: Does her Government intend to retain the Better Public Service Targets to reduce the number of people on a benefit by 25 percent, reduce the number of serious crimes being committed by 10,000, and reduce the number of children hospitalised for preventable conditions by 25 percent? Rt Hon JACINDA ARDERN (Prime Minister): No. We will have our own system for monitoring and reporting on performance against our priorities. Our targets will reflect our different priorities from the previous Government and will look beyond simple measures and, in fact, to underlying causes. Rt Hon Bill English: Did the Prime Minister consider past success of selected targets that addressed areas of persistent social dysfunction, such as reducing welfare dependency, reducing reoffending rates for criminals, holding the numbers of children affected by child abuse, and lifting educational attainment among Māori and Pacific students? Rt Hon JACINDA ARDERN: I think it’s fair to say that probably all Governments share an ambition for reducing crime and improving employment. Our point is that we have a set of priorities that get to the root cause of some of the issues that we’re seeing in New Zealand. A great example, for instance, would be our ambition to measure and target directly issues like child poverty. That’s getting to the root cause of an issue rather than just some of the symptoms, as past Better Public Services (BPS) targets did. Rt Hon Bill English: Why does the Government persist with the view that poverty in New Zealand is purely a function of income, when the evidence is overwhelming that low educational achievement, family violence, long-term welfare dependency, and serial criminal offending have a huge impact on persistent deprivation and material hardship? Rt Hon JACINDA ARDERN: Because the evidence points to material hardship as being one of the most consistent drivers of poor outcomes for children. We’ve never argued that that in and of itself was the only issue that needs to be looked at, which is why, of course, we’re also requiring—and will, as a Government, focus more broadly on—a child well-being strategy for the very reasons that the past Minister points out. Rt Hon Bill English: So can the Prime Minister confirm that the Government is therefore going to abandon a focused approach to social dysfunction, caused by the factors that I’ve referred to, and limit its approach to addressing deprivation simply to the measurement of income? Rt Hon JACINDA ARDERN: No, because, in fact, as the member well knows, we’ve also included material hardship as one of the things that we would like to include and hold ourselves to account on. Our point is that we, in fact, want to be broader in the accountabilities we hold ourselves to as a Government. The BPS targets that the last Government had were quite narrowly focused. They looked at symptoms rather than root causes, and in some cases were manipulated and didn’t lead to improved outcomes. Rt Hon Winston Peters: Will it help in the efficacy of future measurements that she discovered family and child poverty before she entered Government, not nine years after it? Rt Hon JACINDA ARDERN: The Deputy Prime Minister makes a very good point. We have long held a view, based on research and evidence, that if we wanted to improve the well-being of children we could not ignore poverty as long as the last Government chose to. Rt Hon Bill English: Has she seen comments by the State Services Commissioner, who said that the Better Public Services targets achieved real results: “More kids are getting immunised. Fewer kids are being physically abused. Participation in early childhood is on the increase. [And] 40,000 fewer working age people are receiving benefits compared with three years ago. That’s a whole bunch of things that change lives.”, and why does she think that achieving those things doesn’t change lives and ought to be stopped? Rt Hon JACINDA ARDERN: This Government has no problem with the issue of targets, with priority setting, with goals as a way to drive the focus from the Public Service and the Government. Our point is we will have our own. In fact, the last Government changed their own targets several times during their time in Government, and it will not surprise the member that we have a different set of priorities—a broader set of priorities—than them. Mr SPEAKER: Order! I think the member—[Interruption] Order! I’ll just ask the Leader of the Opposition to shorten his questions up to one or two, rather than three or four. Rt Hon Bill English: Has the Prime Minister seen the data that show that maternal and baby care are much more likely to be satisfactory when mothers enrol with their lead maternity carer in the first trimester of their pregnancy, and has she instructed the Public Service to stop focusing on that measure, which was initiated in May last year? Rt Hon JACINDA ARDERN: I am being very consistent in the point here that we need to be much broader in the goals that we set ourselves. I take, for example, the rheumatic fever Better Public Services target that the last Government set. That did nothing to resolve the long-term driver of rheumatic fever, which is cold, damp, overcrowded housing. In the same way, if we want to improve maternal outcomes, we have to look at the barriers as to why women aren’t enrolling with lead maternity carers, and they are complex and often involve deprivation. Rt Hon Bill English: Can the Prime Minister therefore confirm that the target that was set to lift to 90 percent the proportion of women enrolled in the first trimester with their lead maternity carer has now been abandoned, and if so, why? Rt Hon JACINDA ARDERN: We have our own set of priorities. They will be replaced, and they’ll be released in good time. Rt Hon Bill English: So can I take it, then, the Prime Minister is confirming that target has been abandoned, and people working in social and health services are no longer to be trying to enrol women earlier? And if she has abandoned it, what other measures has she taken to ensure that those women who weren’t enrolled will get better maternal care in the next 12 months? Rt Hon JACINDA ARDERN: The implication that those who work in our health services will no longer be interested in the health and well-being of pregnant women in New Zealand is, frankly, an insult. Of course they are, but we’re also saying that this Government’s priority is that those mothers also have decent housing, that they are free of harm and abuse, and that they have decent incomes. We want to get to the root cause of problems, not just the short-term issues. This figure is quite amazing. There were a number of comments criticising the short time period and a lack of comparison as a % of population. Data presentation matters. The graph is not wrong but potentially misleading for people who make snap conclusions without closer interpretation esp on social media (myself inclu). There has pretty much always been poverty and child poverty throughout recorded human civilisation. It is significantly less of a problem in New Zealand than it was 100 years ago, and even 50 years ago, but is still a significant cause for concern. Prime Minister Jacinda Ardern has virtually staked her political career on reducing poverty. Simon Collins (NZH): Reducing child poverty: How will Jacinda Ardern do it? We have always had ­people who struggle to cope because of physical or mental impairments, a rough ­upbringing, illness and mishaps. In pre-industrial times, and still in much of the world today, helping them was left to the wider family or hapū. Industrialisation and its aftermath have splintered those ­extended families geographically. Gradually, over a century or so up to 1984, governments built a ­welfare safety net to fill the gap – ­often pushed by unions and other ­social movements, but also ­reflecting a ­realisation by ­businesses they ­needed workers who could afford to live and customers who could ­afford to buy their products. As well as welfare benefits, the safety net included free or cheap healthcare and education, state-backed wage-fixing and arbitration, state rental housing and subsidised loans for first-home buyers. The state financed more than half of all new housing from 1936 until the late 1960s. That safety net was dismantled after 1984 in a backlash against the “nanny state”. Ruth Richardson’s 1991 Budget imposed part-charges in public hospitals and cut benefit rates to strengthen incentives to work. I think it’s fair to argue that some adjustments were necessary, but it’s also fair to argue that measures may have been too tough. The Government stopped lending for housing from 1992. State-house rents were raised to market rates and tenants were only partly compensated by an accommodation supplement. Not all the reforms persisted. Hospital charges were abandoned quickly and Helen Clark’s Labour Government restored subsidised state-house rents from 1999. Clark’s Working for Families package increased tax credits for children from 2005. Bill English’s National Government raised benefits for families with children by $25 a week from April last year. Further adjustments to try to achieve a sustainable balance between assistance and affordability have continued. The MSD report shows housing cost a quarter of the net incomes of the poorest fifth of working-age households in 1990, but now eats up half of their net incomes. A Cabinet paper prepared for this year’s Budget in May said net incomes after housing costs had fallen by 8 per cent since 2006 for beneficiaries, and by 2 per cent for all households on accommodation supplements. Housing costs escalated after property values doubled under the last Labour led government and then after flattening out they nearly doubled again under the recent National led government. I bought a house in 2001 for $108k, and sold it in 2007 for $245k with virtually no improvements done. It’s rateable value (July 2016) is $275k, but it’s market value estimate is about $335k. The proportion of children in households earning below half of median household incomes is now only moderately higher than in the mid-1980s before housing costs – but is still roughly twice as high as it was 30 years ago after paying for housing. By last year 140,00 children were in households earning below half the median income before housing costs – 210,000 (19 per cent of ­children) after housing costs. National’s Budget had ­already signalled dramatic ­changes to take effect from next April. In a pre-election debate with ­Ardern, English boasted if he could reduce child poverty by 50,000 once, he could do it again. “We said we’d reduce that number by another 50,000 within two or three years, because under good fiscal management the country could do it,” he told Parliament this week. Labour has said it will scrap National’s tax cuts. Instead, it will match ­National’s changes to accommodation ­supplements and raise family tax ­credits even more – by $47 a week for our sole parent with two children, plus $700 a year ($13.46 a week) for ­energy, lifting the ­weekly income in constant 2013 dollars to $528, higher than at any time since at least 1980. Labour will also lift the incomes of the “working poor”, who ­account for almost half the children below the poverty line, by raising the ­income threshold for reducing ­family tax credits from $35,000 a year to $42,700. Beyond the welfare field, ­other Labour policies should reduce child poverty. National planned to extend very-low-cost doctors’ fees to 600,000 people with community service cards, accommodation supplement or income-related social housing. Labour has promised to match that and cut $10 off all ­doctors’ fees. Labour’s coalition deal with NZ First promises to lift the minimum wage to $16.50 an hour next April and to $20 by 2021 and Labour has promised legislation enabling ­unions and employers to negotiate industry-wide “fair pay agreements”. This risks initiating wage/price inflation that will impact on poorer households the most. Wills’ expert group in 2012 proposed six “immediate priorities”, including ­subsidising food in schools, a low-interest loan scheme and more support for teen parents. All of these have either been ­enacted by National or endorsed by Labour, except for a proposal to pass on to custodial parents $159 million in child support payments that are taken by the state to offset the cost of sole-parent benefits. Current Children’s Commis­sioner Judge Andrew Becroft is still pushing for this last change. “It would increase compliance by fathers and it would be good for the children,” he says. The experts then proposed four “priorities over the longer term” to cut the numbers of children in ­poverty by 30-40 per cent. Their first item, “review all child-related benefits”, is under way and the changes are due to take ­effect next April. Labour’s Best Start policy goes halfway towards the experts’ ­second item, a universal family benefit for all children under 6. Twyford’s promise of at least 1000 extra state houses a year also goes halfway towards the ­experts’ third item, increasing social ­housing by at least 2000 a year. So moves in directions that will help alleviate financial pressures but not eliminate them. But Greens are pushing for a ‘no questions asked’ benefit system that would presumably make it easier for fathers to avoid financial responsibility for their children. Housing is going to be one of the biggest challenges for the Government. Wills also believes benefits and taxes need to be reviewed, ­especially to guarantee adequate incomes for families with children. “I look forward to the day when we see fewer poor Māori and ­Pasifika infants in our ­children’s ward with chest infections, when we see fewer children with ­permanent lung scarring and ­stunted growth,” he says. As a country we already do a lot to assist children and families. More is obviously required, but healthy children require a healthy state with a healthy economy. as always it is a difficult balancing act. In their opening speeches in Parliament yesterday both the Leader of the Opposition Bill English and the Prime minister Jacinda Ardern made commitments on reducing poverty. New Zealand under the last Government developed the best tool kit in the world for understanding the context and culture of poverty and disadvantage. It has the label “social investment”—that’s the label it has. The Government needs to understand that higher incomes are part of what you need to reduce poverty, but the other part of what you need is to create some stability and framework in a household, with a family working with someone they trust in order to have the behaviours that can sustain the benefits of better incomes or getting into a job. The case in the New Zealand Herald today—Marie, is it?—the domestic violence death, Marie. It’s the same story—the one we tried so hard to fix, and this Government could fix, if it starts where we left off. It is a case where a terrible death occurred when lots of people knew a bit of the story, and if someone had known the story they would have stopped it. That is what social investment delivers, and if the Government gives that away, they will cost children and families a start in life, and in fact, in some cases, their lives—in some cases, their lives. So I just say to the Prime Minister: we will back her on child poverty, provided she gets over Labour’s problems with social investment and uses the toolkit with the intention for which it was meant, and that is to assist our most vulnerable. Finally, the Leader of the Opposition talked about his willingness to cooperate on child poverty if we continue to collect individual client’s data through our social agencies and our NGOs. It sounds like the trade-off that he gave to NGOs as well. The difference here, on this side of the House, is that we have listened to those concerns. Yes, we will be an evidence-based Government. Yes, we will use data in the way we inform policy. But we will not do so in a way that jeopardises individual people’s privacy. When domestic violence groups tell you that what you intend to do puts a service at risk, this Government will listen. That is the difference in the way that we will govern. I’ve often said I would like to do things differently. I’m going to start on a few issues dear to my heart. There should be no politics, for instance, in child poverty and child well-being. It should be a source of pride for all of us to strive to be known to be the best place in the world to be a child. That does mean I will take up the Leader of the Opposition’s offer. I will extend to the National Party and to ACT the chance to work together on tackling those issues that matter most. What they do with those offers is, of course, each party’s call. But sometimes, in the people’s Parliament, Opposition is about more than being oppositional. This is promising, with the leaders of the two largest parties saying they are prepared to work together to address poverty issues. They will have different approaches on some things, but debating those issues will be an important part of the process, as long as it is done with an aspiration to do what is best for children, especially children iin low income households. Ardern has made this a major focus of her leadership. Poverty is what a person is left with when all other options are extinguished. Now, I’ve often talked about it being a motivation for my entry here into Parliament and into politics, and it’s been what has kept me here too. I am happy for this Government to be measured on what it does for children, which is why we will legislate not just the measures we will use for poverty but the targets to reduce it too. And we do that using a bill that I’ve had in the ballot for probably about six years now, to prove that we’ve long held the view that we need to measure and target child poverty. I cannot fix the housing crisis alone, but we can together. I cannot end child poverty alone, but we can together. I cannot generate higher incomes alone, but we can together—together, alongside NGOs, businesses, council, iwi, and other community groups. Each and every one of us has a role to play in building a better New Zealand. I’ve always said that I believe what unites us is stronger than what divides us, and the campaign only confirmed that to me. So here is my final promise to all New Zealanders. Whether you voted or not, and no matter who you voted for, I will be a Prime Minister for all, and this will be a Government for all. I hope we can focus on what unites us, rather than what divides us, because there is so much to do. We can be better, we will be better, and this is our chance to prove it. Perhaps this will be a different type of Parliament that values cooperation and positive politics alongside robust debate and holding to account. The Hon Tracey Martin, in her role as Minister for Children, will work closely with the Prime Minister to help lift children out of poverty. As the Governor-General so eloquently said, if we put child well-being at the heart of we do, then the well-being of all New Zealanders will be lifted. We have to do better—it’s a moral imperative. Martin has shown a willingness in the past to work with other parties on joint approaches to major issues – she led a cross-party group on climate change. James Shaw also made brief mentions, well into his speech. We are here to support families and to lift children out of poverty. We are here to save our rivers and our endangered species. We are here to solve problems that the market cannot, and the first and greatest of those is climate change. The previous Government also knew that measurement is important. That is why they fought so hard against measuring child poverty in New Zealand. They didn’t measure it so they couldn’t, therefore, be held accountable for it. This Government will make the measure and will take the measure of child poverty. This Government will take responsibility for child poverty and this Government will reduce child poverty. …to me it also sums up the Green Party’s way of doing politics when we are at our best: seeking to solve the great challenges of our time, putting solutions above partisanship, and focusing on the long term. Perhaps Greens will put that approach into practice along with Labour and National. Being in Opposition or on the cross benches for the entire 18 years of our Parliamentary history gave us a lot of time to get good at that. It is my hope that the new Opposition takes a similar approach—and a similar time scale. If we, as a nation, are to restore and replenish our forests and our rivers and our birds, if we are to end child poverty, and if we are to lead the global fight against climate change, it will take longer than three years. It will. Interesting that English spoke more strongly and specifically about poverty than Shaw. Now Metiria Turei is out of the Green picture poverty seems to have slipped down their priorities somewhat. Greens did not negotiate any ministerial responsibilities directly related to children or poverty. ‘End child poverty’ is fairly meaningless idealism. Whether poverty in New Zealand can be ended will depend much on how they decide to define and measure it. There will always be families that struggle, there will always be poor households, and their will always be children who have harder starts to their lives than others. But if the parties in Parliament are genuine in their expressed willingness to reduce poverty and raise employment and incomes then New Zealand may make real progress in improving the standard of living for lower income families and improving the outcomes for children who have missed out in the past.